Barbizon Midwest Review: Barbizon Midwest's Models are Soaring at Six Flags! Barbizon Midwest's Models are Soaring at Six Flags! Barbizon Midwest's models took off on the ride of a lifetime at Six Flags, Great America in Gurnee, Illinois. The amusement park just constructed a brand new roller coaster, and Barbizon's models were chosen to be in the commercial advertising it! These talented models had feature roles in the best seats on the innovative new coaster. 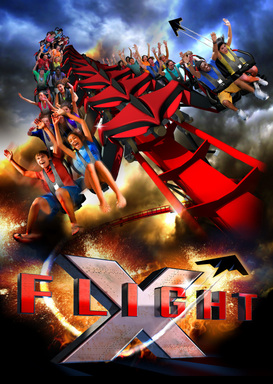 X-Flight takes its riders over 3,000 feet of track and through intense loops, drops and fly-throughs-- all without a floor beneath the seats! It goes up to a thrilling 55 miles per hour, and the models were a hit at the shoot as they soared through the air and enjoyed every second of their ride! While the grand opening of the coaster is not until May 16, the models were able to ride it over 15 times and had a blast doing it. Be on the lookout for the upcoming commercials and Barbizon Midwest's talented models!